They have illustrated their findings with the creation of nano 'sieves' that can help separate molecules down to an unprecedented size 10,000 times finer than a human hair. The research, Superplastic nanoscale pore shaping by ion irradiation, was published in Nature Communications today and authored by Dr Morteza Aramesh, Dr Mayamei Yashar, Dr Annalena Wolff, and Professor Kostya (Ken) Ostrikov. 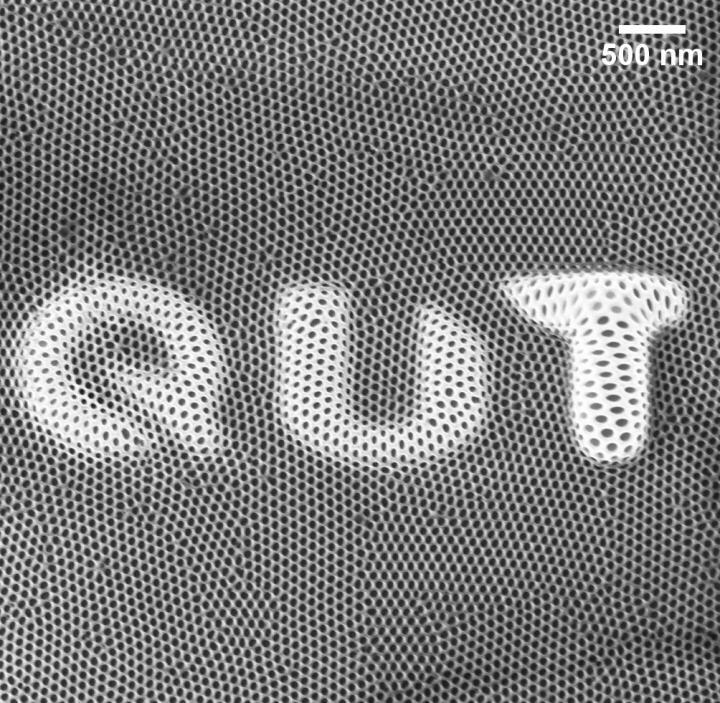 Professor Ostrikov, from QUT's Science and Engineering Faculty and Institute of Health and Biomedical Innovation, said this was one example of the possibilities of using helium ion beams generated in a helium ion microscope to change the behaviour of atoms and create new materials. "We discovered that a beam of energetic helium ions generated in a helium ion microscope rearranged a nanoporous anodized alumina material on the atomic scale and shrank its pores to various, unprecedented tiny sizes," Professor Ostrikov said. "These tiny pores mean scientists could potentially 'sift' molecules into different sizes to study them individually. It could open the way to early detection of cancer, for example, through a blood test that could detect DNA produced by a cancer before the tumour developed. "This new ion-assisted manipulation of matter on the tiniest of length scales completely changed the behaviour of the aluminium oxide: when we applied moderate exposure to helium ions, its pores shrank, when we increased exposure to the ions this normally brittle and porous ceramic turned into a superplastic and gained the ability to stretch more than twice without breaking." Dr Wolff, from QUT's Central Analytical Research Facility in the Institute for Future Environments, said the discovery would allow scientists to play with materials and see the materials' properties change in real time. "We can now play with atomic bonds and see how we can use them to influence the manipulation of matter on the nanometric scale," Dr Wolff said. Dr Aramesh, the lead author of the study, said that for researchers and engineers this finding offered potential new methods to engineer future smart materials. "This new way of re-designing materials will help researchers and engineers to create novel smart materials with different functions, for example, new pharmaceuticals, disease diagnostics and quantum computing," Dr Aramesh said. "We can use helium ion microscopes to image almost any material and to build structures that are as small as a DNA strand, so small that you could fit 64 billion of them in a single raindrop. "Now we can see and manipulate matter on the nanometre scale we are limited only by our imagination in material design."